Georgia was the last of the original thirteen colonies of the United States. It was also the last southern state to rejoin the Union after the American Civil War. Georgia is the only state named specifically for an English monarch, King George III. Known as the Peach State, Georgia's climate is ideal for the production of agriculture. Georgia is a great place to find affordable car insurance, but many families in the state could be saving even more. By comparing the rates of your current company to the rates of other insurance companies, you can protection yourself from paying too much for car insurance. In fact, we can do the comparing for you with our handy free quote tool. You fill out one form and get car insurance rates from several companies. UM and UIM are purchased as a combined coverage option. The amount of UM must be at least as much as the amount of bodily injury coverage that is required by law. How much will your insurance cost in Georgia? Enter your zip code below to find out. If you are moving to Georgia, there are some practical things you need to consider in order to drive legally within the state. Georgia has created a specific time frame during which new residents must replace their out of state driver's licenses and register any vehicles that they own. Purchasing the required amount of auto insurance is also an important part of registering your vehicle in Georgia. If you are moving to Georgia as a student, you do not need to transfer your license and registration because you are not technically considered a Georgia resident. Anyone who lives in the state for a brief period and does not purchase or rent a home is exempt from residency policies as well. If you reside in the state for 60 days and have established a personal residence, however, you will be expected to transfer your license and registration from the state that you previously lived in. If you believe you are in a situation that exempts you from residency requirements but you are not sure, contact your local Georgia tag office within the first 30 days after you arrive in Georgia to find out for sure. When you visit the Georgia Department of Driver Services (DDS) office to transfer your driver's license and vehicle registration you will be required to present documentation that proves that you are a Georgia resident. The tag office will accept a bank statement, utility bill, or rental receipt that is dated within the previous 60 days as proof of residency. They will also accept a check stub from your Georgia employer that contains your Georgia address. If you do not have any of these forms of documentation, you can bring a family member who has a valid Georgia driver's license or identification card with you to the tag office. The state of Georgia requires that you transfer your out of state license within 30 days of moving to Georgia. You can visit any local county tag office to make the license transfer. If you currently hold a valid driver's license from another state, Georgia will honor the other state's driving test and not require that you take another test. All drivers must take an eye exam before they will be issued a Georgia driver's license. If your out of state license is expired, Georgia offers a two year grace period during which you can still transfer your license without testing. You will be required to surrender your out of state license upon receipt of the Georgia license. Drivers with licenses that have been expired for more than two years and those with licenses from other countries will be required to go through a different process than those who are transferring a valid license from another state. Before you will be issued your new Georgia driver's license you will have to present some further documentation of your identity and your residency. The tag office will need a copy of your social security number in the form of a social security card or a letter from the social security administration that confirms your identity. The social security number you give the tag office must match the number that is on file with the government. You will need to provide further proof of identity through a certified birth certificate. If the name on the birth certificate is not the same as the name that is on your driver's license, you will need to provide the proper documentation to illustrate the process you went through to change your name. These documents include marriage certificates, divorce decrees, or other official documentation of the name change procedure you went through. New Georgia residents who own vehicles that are registered in other states will be required to transfer their registration and title to Georgia within the first 30 days of residency. This can be accomplished at the same tag office that handles driver's license transfers. Georgia considers you a resident if you have lived in Georgia for 30 days and rent or own a permanent dwelling. Students who drive in Georgia while attending school are exempt from this rule. If you are unclear about your residency standing, contact your local county tag office with any questions you may have. It is a good idea to obtain your Georgia driver's license before you transfer your car's registration and title. To register your vehicle, you need to visit your local tag office with the proper documentation and your valid Georgia driver's license. Different counties in Georgia have different requirements for vehicle registration, but in general, you will need to have a Georgia certificate of title for any vehicle that was made in 1986 or later. Some Georgia counties will allow you to complete the registration paperwork at home and mail it in to the office, but most require that you register your vehicle in person. The registration process involves filling out an MV-1 tag and title application and submitting it to the tag office clerk. You will need to present your proof of residency and insurance, as well. Make sure the name of everyone who jointly owns the vehicle is on the form if applicable. If your vehicle is under lease or owned by a bank or other lending institution, you will need to fill out a separate form as well as the MV-1. Cars that were manufactured less than 25 years ago and prior to 2010 will need to have documentation that they have successfully passed emissions testing. Georgia drivers are required to carry a minimum of liability auto insurance. This insurance can be from any agency that services the state of Georgia. You will not be able to register your vehicle until you can present proof of insurance that has not expired. 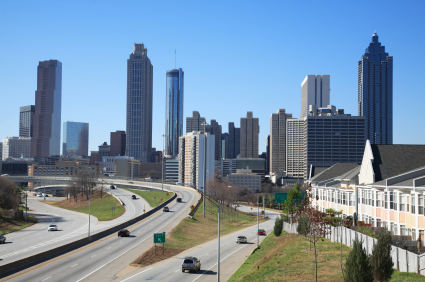 Insurance rates for Georgia vary widely depending on where you live. They also vary based on several personal demographics. The best way to find out the best rate for your insurance coverage in Georgia is to fill out the zip code form at the top of this page and compare several rates from different auto insurance companies.